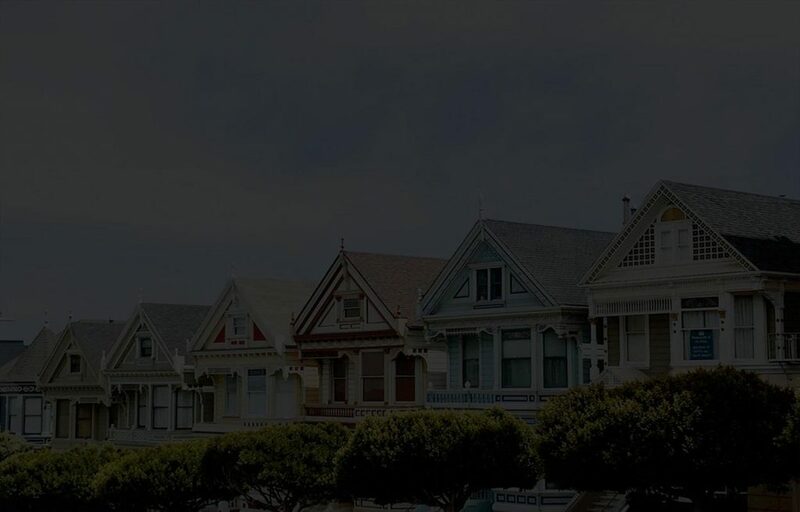 There is a lot of information on the internet about dry rot, and probably even more misinformation. I’ve been told variously that it can move water up to 30 metres from its original source, or that it can’t move water at all. That it can go through solid concrete, or that it can only get thru fissures in loose mortar. That it can destroy a whole building and neighbouring buildings from within, or that it can’t. That it can be killed by cutting off it’s water source, or that it can’t. LOADS of contradictory information. So, in this blog I won’t rely on any of these sources, but will just tell you what I have seen with my own eyes. First off I’m a carpenter and builder, not a dry rot specialist. If you have issues with (for instance) a cartilage injury in your knee, you’d get a referral from a GP to an orthopaedic specialist. I’m like the GP. 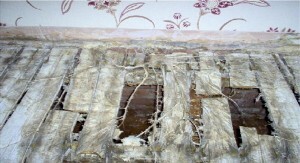 Although I know the signs of dry rot, I certainly don’t know everything there is to know about it. 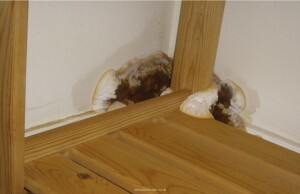 If I suspect dry rot, unless it’s fairly minor and easy to contain, I’ll refer it to a specialist. The risk for most people is that they get mis-sold a lot of unnecessary, costly and toxic chemical treatments. Sometimes the simple removal of the infected timber and isolation of the new timber from any water sources would be enough. As a builder it’s much harder for anyone to pull the wool over my eyes, but a private customer needs to beware of this, get three different quotes and ask each about the alternatives. You also want a 30 year insurance-backed guarantee. Having said that, I have eradicated it by simply removing all the visibly affected wood, and cutting back a further metre beyond that. The wood was burnt. Any fruiting bodies (more on them later) were removed carefully and burnt to avoid re-infection. Hyphae were destroyed with a dilute brick acid mix. This is hydrochloric acid, which is dangerous as it can burn, but not toxic. Then all potential sources of moisture were removed or sealed up to dry the building out and prevent any moisture getting back into the wood. Damp Proof Membranes were placed under timbers which were resting on damp masonry. 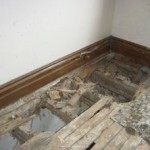 The Lacrymans latin name for Dry Rot may relate to the English word ‘lachrymose’ meaning to cry excessively. Dry rot spreads a ‘mycelium’ (fungus root formation) of ‘hyphae’ (fungus roots) often covered with water droplets, like tears. It can cover a wide area including walls, concrete floors and other surfaces which you would think would offer it no succor. It looks a bit like a very course spider’s web in the morning dew. It will also have a fruiting body or fruiting bodies somewhere. These look like flattened, white (when unripe) to rust-brown patches sticking to a suitable surface, and could be just an inch or so diameter to 18 inches or more. They release millions of rust-coloured spores and a fungal smell. I have never seen the fungus grow in dry conditions such as in the open in a reasonably dry room. I have seen it grow openly in damp rooms. It appears to need high humidity for the mycelium. This would explain how it creeps secretly throughout a building, under floors, behind skirting boards, through damp walls and cavities. A damp-loving, dry-hating habit which means it doesn’t show itself on the surface of the wood until it has rotted out the heart and all the hidden parts of the building. The fruiting bodies tend to appear in more open, drier spaces, so that spores can be wind-distributed. In the third pic you can see how it has destroyed the floor under the lino, which would have kept the dampness in, while it has only just started to show as a crinkling on the dry surface of the skirting. 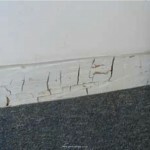 The first indication may be a floor dropping below the skirting, although wet rot can also cause this. Or a slight crinkling of the surface of the wood. Then the wood shrinks more and cracks along the grain appear. Then cracks across the grain appear too, leading to the classic cuboidal cracking. BUT – many other types of fungus can also lead to these signs. If in doubt, get it checked out.